Effective fat loss training starts in the kitchen. However, when you get to the gym, you can accelerate your fat loss efforts if you do the right things in the gym. In part 1 of this post, I gave you 6 program design tips for faster fat loss. Here are 6 more ways to train if you want to burn fat faster - enjoy! Most people trying to lose fat waste way too much time training their abs. Sure some direct ab training can help create good trunk strength and even help to hypertrophy the ab muscles (only relevant for those who are really lean), but it will not strip fat off your body. Keep your ab training to a bare minimum and when you do direct ab exercises, pick ones that are hard on your whole body, not just your abs. Light weight, high rep training is better than nothing, but it is not the best way to get toned. Yes, some low and high reps are great, but do a large majority of your work in a moderate rep range. These will not make you "toned"
Many people shy away from big weights and hard training for fear of bulking up. Don’t worry. For most folks, being worried about gaining too much muscle is like worrying about making too much money or getting too good looking. When you build lean muscle, you spend extra calories 24/7 to keep that muscle on. This will increase your metabolic rate will help you get and stay lean! I find it ironic that people try cardio first for fat loss, find out that it fails to get them to their goal. Then, they try resistance training, but they use ridiculously light weights with no rest. Thus they basically turn resistance training into cardio which didn’t work for them in the first place. Keep your training intense, but anaerobic. A short rest between sets can allow you to work much harder and use a lot more weight. I typically have clients and athletes rest 30-45sec between sets when doing alternating sets and 20-30sec between exercises in a circuit. When it comes to fat loss, you want to stay away from the middle intensity stuff (i.e. traditional cardio). This type of cardio teaches your body to become fuel efficient and lowers your metabolism. Instead, focus on high-intensity interval training (e.g. hill sprints). Then for healthy and recovery, add in a bit of walking. How about you? If you have other training strategies that you have found effective for fat loss, please share your comments below. 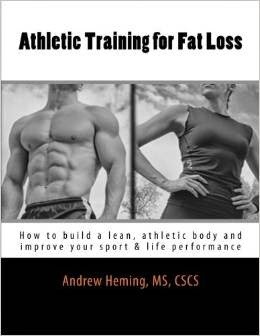 Also, for a complete guide to athletic-based training for building a strong, powerful lean, athletic body, check out my book Athletic Training for Fat Loss.